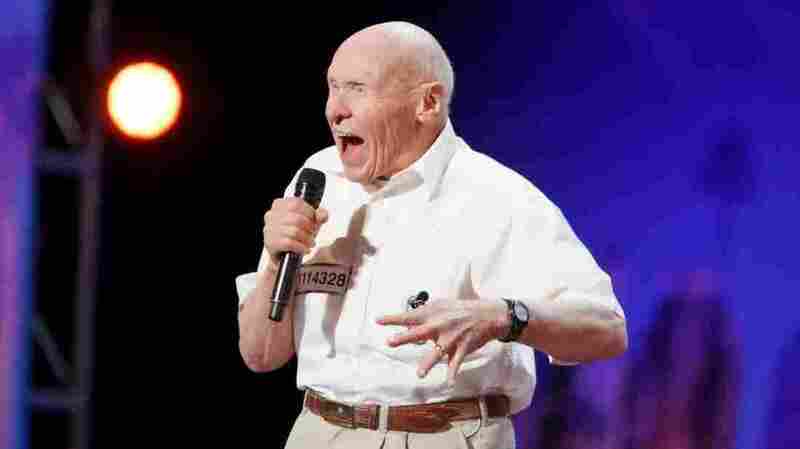 Unlikely Headbanger John Hetlinger, 82, Goes From Singing Karaoke To 'America's Got Talent' : The Two-Way An octogenarian delivers a face-melting version of a song that's been a hallmark of pro wrestling and action movies. John Hetlinger, 82, unleashed his version of the heavy metal song "Bodies" on a karaoke audience two years ago. Tuesday, he rocked America's Got Talent. He flew jets for the Navy and helped fix the Hubble Space Telescope for NASA. But at 82, retiree John Hetlinger is making waves for his full-throttle take on a famous heavy metal song. Hetlinger's gusto has taken him from karaoke night to an appearance on America's Got Talent. Earlier Tuesday, Hetlinger also became an unlikely star for the Born and Bred Metalhead Facebook page: A video of the octogenarian throwing himself into Drowning Pool's 2001 song "Bodies" — the same song he performs on America's Got Talent — drew more than a million views in just seven hours Tuesday. That's far more people than the number who viewed Hetlinger's own posting of the video back in 2014, when he gave it the caption, "karaoke at The Glenn 80 yr old man sings Drowning Pool 'Bodies'!" We'll warn you: The video ends with a bit of entirely earned profanity. Part of the fun of that video is watching a crowd of patrons at an outdoor karaoke bar being served a full range of dissonance — cognitive and sonic — as the man in the pleated dress shorts, with the leather belt and what looks to be a toucan on his (tucked-in) shirt, hurls himself into a face-melting version of the song that's accompanied everything from pro wrestling matches to Guantanamo Bay detentions. On a bigger stage for Tuesday night's performance on America's Got Talent, the same effect takes hold, with Hetlinger, now in long pants but otherwise looking unchanged at 82, dives into the song's opening chant — "Let the bodies hit the floor" — and the audience, along with Simon Cowell and the judges, gape at Hetlinger's powerful version of the song. We don't have any inside info on how Hetlinger does on the show. But we'll say this: It's no coincidence that Hetlinger rhymes with headbanger. As for what took him so long to take the stage, Hetlinger explained to Cowell that he only started doing karaoke after he retired.